"... First Violinist Marcus Barcham Stevens brought a soaring beauty to phrases reminiscent of the pastoral ecstasy of Vaughan Williams" - the Strad magazine, 2004, for a performance of Gabriel Jackson’s String Quartet Ring of Waves. "Bach's Double Concerto was a delight, violinists Marcus Barcham Stevens and Briony Shaw complementing each other's tones in a gorgeously crisp account" - the Birmingham Post, 2003. …two splendid guest artists - conductor Timothy Carey and violinist Marcus Barcham Stevens .The overture…was a suitable curtain-raiser to Marcus Barcham Stevens' beguiling account of the Violin Concerto No 3 in G major… The closing rondo movement was filled with youthful, not to say cheeky, witticisms and has a winds-only ending which is most unexpected. The concerto's adagio was for me a revelation. Flutes replaced oboes and the muted strings created an almost mystical sound-world.” – John Ricketts, the Gloucestershire Echo, Nov 2010 for a performance with the Cheltenham Chamber Orchestra. “…Marcus' Italian violin was able to soar with surprising ease. But it was the couple's emotional integration in - and through - the music that was the most compelling... Music Nairn has given us a moving and unforgettable evening.” – Patrick Zentler-Munro, Music Nairn 2009 for a recital with pianist Christina Lawrie. “Simon Steen-Anderson’s Study for string instrument #1 (2007) – performed by Marcus Barcham Stevens – focused on a gesture and through repetition the player could focus on different components of the gesture, accentuating the timbral components of a glissando on a single string. Marcus controlled the tone with aplomb, demonstrating precise tonal control which made the work fascinating to hear.” – Steven Berryman, “I care if you listen”, for a performance at King’s Place, London, Oct 2011. Marcus has broadcast as a soloist and chamber musician on BBC Radio 3 and live in recital on Classic FM. BBC Radio 3 broadcasts in 2011 comprised Kodaly’s Duo for violin and cello, Bartok’s trio Contrasts and Dohnanyi’s Sextet with the ensemble Chroma, and Simon Steen Anderson's solo piece, Study for String Instrument, from London King's Place. He has performed chamber music with Peter Donohoe, Paul Lewis, Freddy Kempf, Peter Hill, Emmanuelle Haïm, Alina Ibragimova, Leon McCawley, Paul Watkins, and with Thomas Adès in music by Adès at Carnegie Hall. As a chamber musician, Marcus has performed at the Wigmore Hall, Purcell Room with the Park Lane Group, Manchester's Bridgewater Hall, Symphony Hall Birmingham, the International Musicians’ Seminar Prussia Cove, the Library of Congress in Washington, the Haydn String Quartet Festival, Esterhazy, the Opéra Comique, Paris, the BBC Proms (RCM), and for several years at the London BMIC Cutting Edge Series. Solo playing has included: Lou Harrison’s Concerto for violin with percussion at the London Spitalfields Festival in 2003 (broadcast on BBC Radio 3), the London première of James Dillon's Traumwerk III for violin and piano with Jonathan Powell for the BMIC in 2005, Vaughan Williams’ The Lark Ascending in St. Asaph Cathedral for the North Wales International Music Festival 2011, Xenakis’ Dikhthas for violin and piano with Roderick Chadwick at King’s Place in 2010, David Sawer’s The Memory of Water with the Birmingham Contemporary Music Group, Richard Hoadley's Calder's Violin for violin and computer at London City University, Bach's Violin Concerto in A minor and the Double Violin Concerto with ICE, which was formed out of string players from the CBSO, Mozart's Violin Concerto nr.3 with the Cheltenham Chamber Orchestra and Berg’s Violin Concerto with the Cambridge University Music Society. 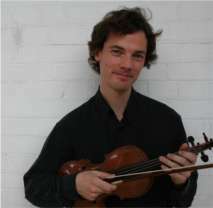 Marcus held the position of Principal First Violin with the CBSO from 2000-2002. 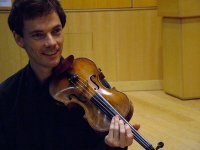 He has played as guest Principal 2nd Violin for: Sir John Eliot Gardiner's Orchèstre Révolutionnaire et Romantique (at the Opéra Comique, Paris), the English Chamber Orchestra and the Scottish Ensemble. He has also played with Sir John Eliot Gardiner in venues including Carnegie Hall New York, Musikverein Vienna, Concertgebouw Amsterdam and Pisa Cathedral. Marcus has also played with Rachel Podger, Garry Cooper and Jane Booth in the period ensemble f2 at the Wigmore Hall; with the fortepianist John Irving; and in a recent Hyperion CD with Jonathan Cohen’s ensemble Arcangelo. He has also recorded Haydn’s horn trio Divertimento a tre for the Bate Collection, Oxford. Marcus received starred First Class Honours in Music from Cambridge University and the Diploma for Advanced Instrumental Studies from the Guildhall School of Music and Drama where he studied with David Takeno. He was awarded the Norman-Butler Scholarship from the English-Speaking Union to the Tanglewood Music Center USA, where he was invited back as a Violin Fellow and received the Henry Cabot Award for outstanding contribution. Marcus is recipient of the Harriet Cohen Award, a scholarship from the Clothworkers City of London Guild, the Donald Wort Prize for performance from Cambridge University and the Mortons Bequest for performance of Beethoven from the Guildhall School. Marcus has run a Strings and Piano Composition project at the Guildhall School, which combines student composers, pianists and string-players in new pieces. He has coached at the Apple Hill Center for Chamber Music in New Hampshire USA, for players of mixed ability and teenagers from deprived US inner cities, and at the Baltimore School for the Arts. With the ensemble Chroma, he has been involved in substantial education projects in schools in Spitalfields, Norwich, the Shetland Islands and Norway, and with BCMG in Birmingham. Other education projects include: schools in London, Amersham, Basingstoke, Birmingham and with Ensemble Cymru in North Wales; at the universities of Royal Holloway, Cardiff, Bristol, Durham, Coventry and Birmingham and at the Royal Academy of Music; at the Wigmore Hall with BCMG; teaching at the London Guildhall School Junior Department; for COMA at Leeds University and through the OAE and “Jessie’s Fund” in Taunton.